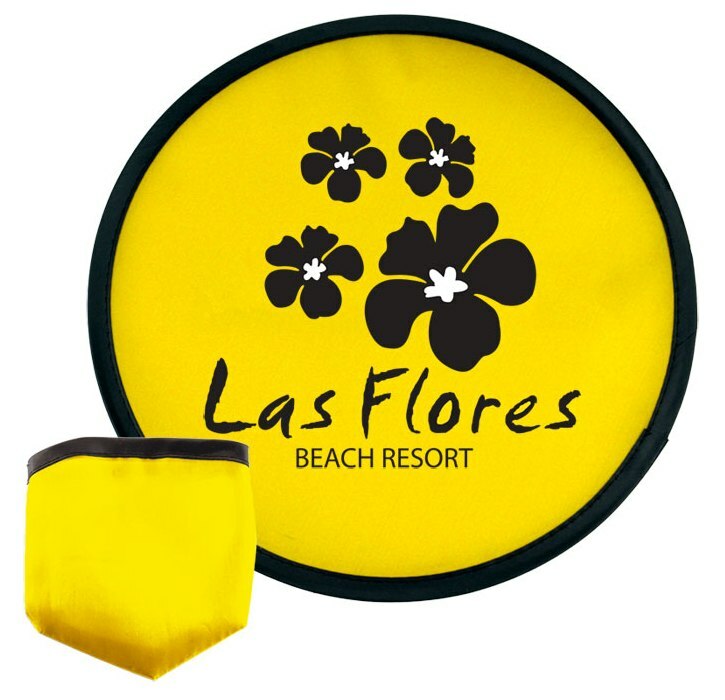 Get your logo printed - Ten Inch Folding Frisbees promotional items. Apps are outdoor related events, advertising, promotional products. Additional apps trade show giveaways, conventions & conferences. Almost any business can use these flyers as promos w/ your logo. Durable & long lasting Polyester Frisbees. Your Choice 7 Colors. Overall size of the Folding Promotional Frisbee is 10" Diameter. Includes a pouch size 4 3/8 x 3 5/16. Shipped not assembled. For folding frisbees inserted into a pouch add $.35 each unit. Price includes a one color imprint one side area 7 1/2" Dia. add a $55.00 setup and running charge of $.35 each. Area for optional pouch imprint 1 3/4" w x 2 1/2" h.